Last week I blogged on the echoes from the 1930’s and the German position after the Versailles and Locarno treaties and the U.K. position and the E.U. at the present time. The blog was based on the book Retreat from Glory by R.M. Bruce Lockhart. The Retreat from Glory can be applied in the ironic sense to the EU as it negotiates Brexit. Here I am indebted to Guido Fawkes for the chart. Well, faced with €12 billion walking out of the door who would not be petulant. What’s more interesting is that France with an economy and population comparable to ours makes a net contribution less than half of ours. Why does Italy pay make a net contribution and Greece makes a net withdrawal? There’s a Ph.D. project in the making as to the relationship of contributions to GNP, who comes out best and why. 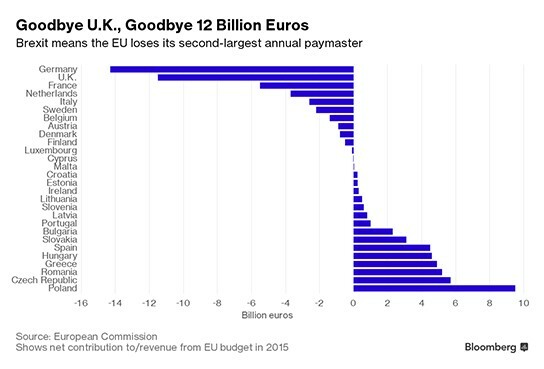 But looking to the future there are two questions to be asked: What will we do with the money we no longer pay to Brussels and What will the EU do to fill the hole?